79 years ago ended the Chaco War and makes public the volume 78 is emblematic stories, he discovered literature to a new country. “You are now homeland, Chaco, / of the dead deep in your belly / in search of the soul that does not exist at the bottom of your wells.” Metaphor and design, this fragment of the poem that opens the storybook Mestizos Blood (1936 ) sums up the spirit of a generation and the caliber of its literature. It was the year 1936 and the country woke up from the nightmare of the Chaco War (1932-1935), Nationalism seed that was to incubate the Revolution of 52 . Augusto Cespedes, el Chueco [nickname, the twisty] (1904-1997) -. Was then a journalist in his thirties, just back from the front with a volume of eight stories about the conflict that pitted Bolivia and Paraguay on the pretext of oil. 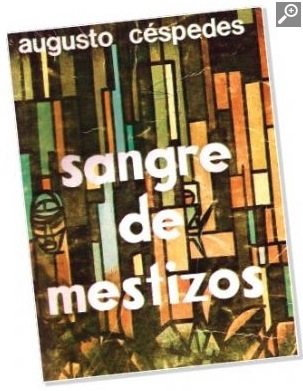 Mestizos Blood: narratives of the Chaco War was published in 1936 in Santiago de Chile. With this book came others who promptly formed the landscape of literature called the Chaco: Oscar Cerruto with Aluvion de Fuego [Barrage of Fire] in 1935 and Augusto Guzmán, Prisoner of War, in 1937. Céspedes’s work, however, has a testimonial dimension that reveals not only the harsh “reality” of the battlefield, but also mutations of Bolivian society of the times. It is not casual. “Twisty” was primarily a journalist and as such was a correspondent for the La Paz newspaper El Comercio in the battlefield. His chronicles – heroic gathered later in the book Chronicles of a stupid war (1975) – are pioneers of a genre that was still to be invented. Don Augusto was for two years a war correspondent. Back in La Paz, enlisted again, this time as a soldier. He was in the front to the end of the war and it is possible to imagine that, in these dark nights of shrapnel and the heat of the stories and memories of friends, the characters that inhabit were born in Mestizos Blood. “Summer without water. In this area of ​​Chaco, northern Platanillos, almost unheard of, and how little it rained, has evaporated. To the north, south, right or left, where you look or walk in almost immaterial transparency forest leaden logs, skeletons unburied sentenced to stand in the bloodless arena, not a drop of water, which prevents form living here the men of war. We live, stunted, miserable, prematurely aged the trees with more branches than leaves, and men more thirsty hate”… write the character of the Bolivian sergeant Miguel penknives, pen Céspedes, El Pozo. This, perhaps is one of the most beautiful stories of Bolivian literature, tells the story of a battalion of Bolivian soldiers in desperate search for water in the Chaco wasteland. Other stories – The Paraguayan, The Colonel, Rats, El Milagro, Oil-smoke also bet on the streak of realism. As Faulkner, – René Zavaleta Mercado said – Augusto Céspedes does not mention the acts but the purposes, facing thus the experience of men in war as an existential horizon and, more precisely, tragic. “Behind the Front dramas, which then staged Céspedes is the conflict of men with these ‘tragic ghosts’, these ‘objectives gods’ (death, nature, power) that look at the characters who serve and are facing,” says the Dr. in Literature, Marcelo Villena. There are also tales in Augusto Cespedes, which is essential for great literature: the ability to create characters – the Sirpa soldier, Sergeant Cruz Vargas – capable to explore love, fear, power with the – determining – background of war. “Will this finish someday? … No longer dig to find water, but to fulfill a fatal design, an inscrutable purpose. The days of my soldiers are immersed in the maelstrom of mourning concavity that leads them blind, ahead growth of its esoteric deaf, screwing them to earth” (the Well). On June 16, the 79 anniversary of the cessation of the war was celebrated. There were speeches, tributes silence but for the protagonists who found their country in war violence. These, with gold lettering, must be Augusto Céspedes and Mestizos Blood. Birth. Augusto Céspedes (1904-1997). He was a journalist, writer and politician. Works. Mestizos Blood (1936), Metal of the Devil (1946) and The Hanged President (1966), among others. This entry was posted in Bolivia and tagged Chaco War, history, literature. Bookmark the permalink.